4:09:43. The exact time displayed on the clock when the first bomb went off. 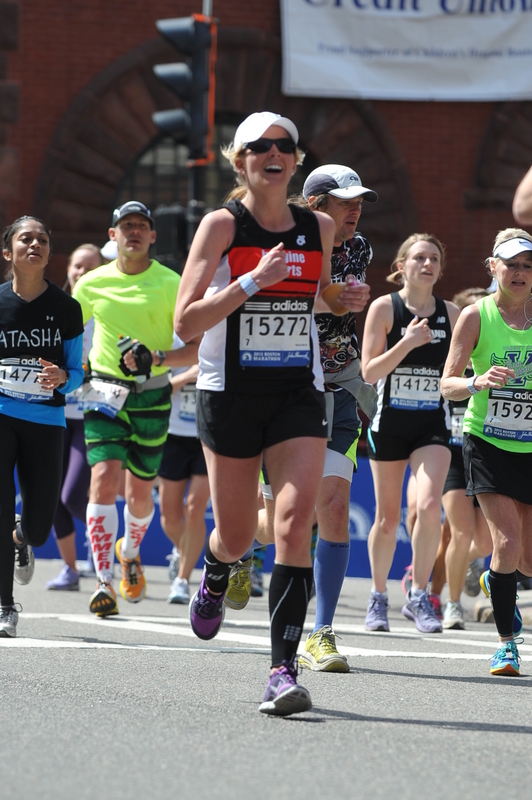 Our last split second of normalcy before tragedy shook us at the 2013 Boston Marathon finish line. And 13 seconds after that, the second bomb exploded further down the course – with a piercing sound just as loud as the first. The world would never be the same. Tomorrow we return to Boston. 36,000 runners will run with more love, passion and determination than ever before. Fearless. Full disclosure, 4:09:43 is a recent book by Hal Higdon who is an amazing coach and former elite out of Chicago. He has ran over 115 marathons (and counting) at 80 years old! I pre-ordered his book before it even came out. I was so interested in hearing all of the heroic stories that came out of that day and finding peace in the intimate personal accounts. Well, I’ve tried to read it probably 10 times. Just can’t seem to turn through the pages. It’s still too real. Too vivid. Too close. 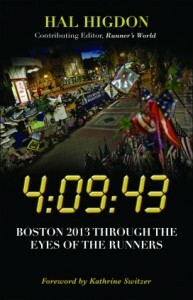 The book takes you through the very-real hills of the course-map, following different runners from their stories of that day. Starting from a runners pre-race hotel room all the way to the finish line (and medical tent). These intimate personal accounts are raw and uncensored – I couldn’t get through it knowing the clock was ticking to 4:09:43. All these runners have worked their whole lives to earn a spot in the most prestigious road race in America – and then shattered.I know one day I’ll be strong enough to read the book in its entirety (and get back to Boston!) But in the meantime, I received a little piece of “my story” from that I want to share. A piece that I haven’t heard until now…. We were getting reports from Dustin and Paul that helped us get a better idea of where to look in the mass of people. The swarm became so thick that I started to get worried. “What if I don’t find her? What if she can’t hear us yelling for her?” Then, out of the blue I hear you yelling at us…”FAMILY!” The elation of seeing you was amazing. You looked so happy, so strong. I’m still amazed that you saw us considering the number of people that you must have passed to that point. I remember the train ride back into town and the people from Michigan we met on the train. The heat and smell of the train, the neighborhoods we passed and the pulse of the train over the tracks – for some reason, still vivid in my mind. All the while focused on one thing – finding the next spot to watch you beat this course. After helping your parents with directions to the Park Street station (near the hotel) Jenn and I arrived at Kenmore Square, mile 25. Paul continued on the train to find you at the finish line area. We came up from the underground station and couldn’t believe the number of spectators on the course. “How are we going to find Julie? Will she see us? Will she hear us?” I had to find you…you needed us. Jenn and I were standing in front of Hotel Commonwealth and only a few minutes after finding an open spot along the course, we saw you. I can’t believe how strong you looked. You knew what you were going to accomplish at this point…I could see it in your face. I kept thinking about the pain you must have endured since we saw you earlier in the course. But I was at ease knowing that you had made it this far, nothing was going to stop you. “One more mile…she has this!” I can’t describe the amount of pride and joy I felt…emotions poured out. It was 1:51 PM and in an hour our lives would be changed. From this point on, everything was surreal. At Hotel Commonwealth we were on the south side of the course and I knew we’d never be able to cross the grand stand area. The area was so busy that I thought it was best to stay clear. “Was Paul sitting in the grand stands to see Julie finish?” I hoped he was there. Now I know better – thank God he wasn’t. We crossed the course the only way we could…by going back into the Kenmore train station under ground. There were Boston Red Sox fans everywhere. The baseball game had ended about an hour earlier and the crowd had started to arrive downtown to see the marathon. Once we crossed back to the north side of the course, we walked along Commonwealth Avenue to the east and then took a slight turn to the northeast at Massachusetts Ave. The Commonwealth Mall area is this beautiful wide grassy area that runs through the Back Bay area and all of these pristine row houses. Pure Boston. I was amazed at how quiet it was in this area even though we were only a couple blocks parallel to the course. In fact, we were probably within a couple hundred yards of two terrorists as they walked through the crowd. Then I noticed something strange. Unmarked SUV’s lined up for blocks along the center of the walkway. We kept walking and the curiosity got the best of me as I peaked in the windshield of one of the vehicles. FBI. “Why are there so many FBI vehicles here?” Then I noticed a long yellow tent along the walkway and it struck me as odd that water hoses were sitting on the ground near the fire hydrants. Then I noticed something intriguing about the tent – “Mass Decontamination Unit”. I remember thinking to myself “I can’t believe all of this is here.” I received a text from Paul so this thought didn’t cross my mind for another 45 minutes. Paul needed our help finding you. “Be right there” was my text reply and I looked at Jenn and said “Your sister needs us.” The time was 2:26 PM and in 23 minutes our lives would be changed. The Family Meeting Area was a mass of runners and family members. I remember looking at runners in their space blankets hoping that they were warm enough. I hoped you were warm enough…you’re always cold. There was a chill in the air that I can’t forget. We were headed toward the letter S area and for some reason I decided to have Jenn go ahead to the corner of Arlington and Stuart. Oddly I turned back toward Boylston…toward the finish line to find you. I was at the corner of St. James and Arlington when I heard the first explosion. I was one block parallel and three blocks from the finish line. I remember thinking “Why is a cannon going off?” Something didn’t feel right. I received a text from Jenn that she had found you and then it happened again. A minute had passed and another explosion echoed off the walls of the buildings around me. I looked at a lady sitting on the ground. She looked at me with these inquisitive eyes – like she was saying “what WAS that!? !” She was in obvious pain but I needed to find you. I just looked at her and said “this is not good”. Our lives were changing. Our phones suddenly stopped working. The network was down but I didn’t realize why at the time. At least not consciously. Then I saw you and how much pain you were in. At that moment I think something clicked internally that put everything together. We were in the middle of something serious and I needed to get you, Jenn and Paul out of there. I still don’t know how we were fortunate enough to see an available taxi in that instant. During the cab ride back to the hotel I kept hearing sirens and seeing emergency vehicles pass us, confirming my fears. Those weren’t cannons that I heard a few minutes ago. People had died and our lives had changed. ~ My brother-in-law’s insight from that day. What an amazing recount. I was safely back at the restaurant next door to the hotel but I remember everything from that moment and that trip. 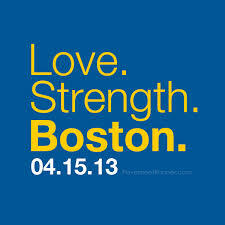 And I’ll be thinking of Boston and all those runners (and those that couldn’t make it back) tomorrow!